The (e)merge art fair is back for its second iteration. The dates are October 4-7, 2012. Last years's inaugural edition of (e)merge featured 80 vetted exhibitors with works by artists from 21 countries. Over 5500 attendees visited the gallery and artist exhibitions, performances, panel discussions, curatorial museum walk-throughs, and private collection tours. Online applications are now being accepted and the application deadline is April 27, 2012 and notifications willsent via email by June 2012. - Whereas work in all media will be carefully considered, projects involving experimental works in non-traditional formats are especially encouraged . Such work may include installation, conceptual art, performance, new media, or the inventive use of materials to express challenging concepts. In 1854, founded by anti-slavery expansion activists, the modern Republican Party of the United States was organized in Ripon, Wisconsin. It was great reading and seeing your ads artwork on http://www.theartsmap.com. i would like to make a purchase as i'm really interested in it. Let me know the last price and if it still available for sale and it's present condition let me know if you are the real owner, and send me pics as for the Shipping i will take care of that through a pick up. The Bethesda Urban Partnership and Bethesda Arts & Entertainment District has announced “Tunnel Vision,” a public art exhibition to be hung in the Metro Tunnel that runs under Wisconsin Avenue in downtown Bethesda. “Tunnel Vision” will showcase the work of 12 selected artists inside the Metro Tunnel. Interested artists are invited to submit up to 5 images of their work for review. 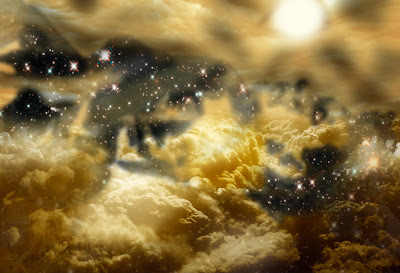 Each artist will be paid $500 for the license to use their image. If selected, artists will need to provide a high resolution file for the image of their artwork to be printed on a poly metal material, size 4' high x 8' wide. Artists are encouraged to submit artwork that can easily be sized to 4’ x 8’. 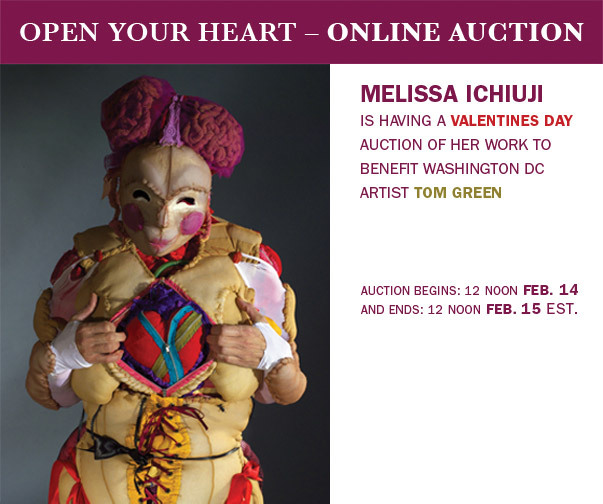 Artists must be residents of Maryland, Virginia or Washington, D.C. to be eligible for consideration. There is a category for young artists, age 14-17, to apply. The deadline for submitting images for review is Friday, March 9, 2012. Interested artists should visit this website for more information and the application for consideration. In this new work, the artist engages issues of identity and race by appropriating the brown paper bag as a cultural symbol identified with bag lunches, alcohol and skin color. Wilson amassed dozens of inflated bags to construct a monumental sculpture with undulating, fleshy forms. On the opening day of the exhibition, from 5 to 8pm, Wilson will present a durational performance: “From My Paper Bag Colored Heart.” Exploring the history of the paper bag as an indicator of racial color, Wilson enacts a liminal struggle between freedom and self-destruction. There will be an opening night reception, Saturday, May 17h from 6 to 8pm. Artists in attendance. Wilmer Wilson’s performance will begin at 5pm on Saturday, March 17th and culminate during the opening reception (6-8pm). Coincidence or one great artist borrowing from another? I know that I am a pedantic Virgo. But I also know that seldom there are coincidences when things look a little "too close." The spectacular art show that otherwise progressive art critics love to hate (and thus reveal their real neocon roots to control, judge and jury everything), and the rest of the art world loves, is back for 2012! All the details you need are here. Entrance at 2511 S. Clark St.
Adams Morgan’s Pop Up Shop is a temporary retail art shop for April and May. They hosted one last year with over 50 artists. Volunteers are also welcome to help man, sell and set up the shop! SELECT Gala Party Tickets on Sale Today! A limited number of SELECT party tickets are now on sale! 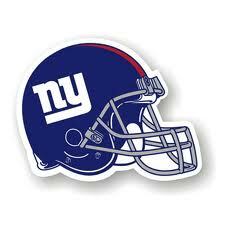 Tickets are $150 and include silent and live auction bidding, open bar, dessert, and coffee starting at 8:30pm. Purchase party tickets today on this website here or contact Christopher Cunetto at ccunetto@wpadc.org or 202-234-7103 x5 for more information. Next Monday February 27, a number of former MICA students, which includes Jeff Koons and Philadelphia's Frank Hyder, will be assembled at MICA in Baltimore to celebrate the retirement of Albert Sangiamo, who was their first mentor. The list of artists attending is very impressive; Sangiamo was chair of drawing at MICA for more than 40 years. 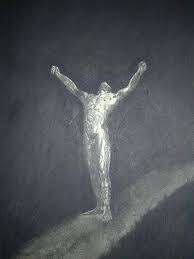 He was a student of Joseph Albers and was hired to help make the Institute a first class art school. Jeff Koons will be making a presentation at noon, followed by a luncheon. I would have picked somewhat of a better title for the show, but watercolors by Barbara Bell, collages by Merry Lymn, digital work based on photographs of flowers by the very talented Bert GF Shankman, fused glass portraits of dogs by Shirley Hendel and ceramics featuring cats by Leigh Partington all make up the next show at Potomac's Gallery Har Shalom (located at Congregation Har Shalom, 11510 Falls Road, Potomac, MD) and because we're neighbors, I really want to make sure that this gallery gets some attention! And here's an opening that starts at 11AM! Washington City Paper, Gazette, Potomac News... now you can find out if your art writers ever get up before noon! In my house I'm the boss; my wife is just the decision maker. We're up in the Poconos for the long weekend; sounds like many of you have heard from "Brandon", the art scammer busted in the previous post. And nice snow here... the kind that makes everything white except the roads! 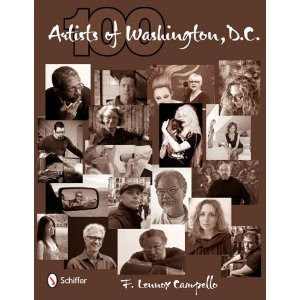 There will be a book signing for my 100 Artists of Washington, DC book today, February 16 from 6:30 - 8:30PM at the gorgeous BlackRock Center for the Arts in Germantown, Maryland. 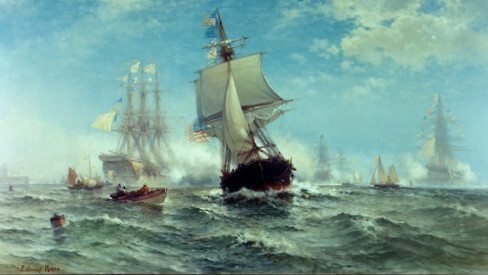 OK, so it may be Valentine's Day today, but for us history buffs, in real history, in 1778 the United States flag is formally recognized for the very first time, in this case at sea by a foreign naval vessel, when French Admiral Toussaint-Guillaume Picquet de la Motte renders a nine gun salute to USS Ranger, commanded by the legendary John Paul Jones. That's the spectacular painting by Edward Moran depicting the moment. There are hardworking artists and then there's Russ McIntosh. If I told you that in the last year alone this talented digital artist has been included in over 20 exhibitions around the nation, you'd be as awed as I was when I discovered this fact. Finally you can now make your Cuban or Cuban-American's dreams come true! Cuba's brutal dictator and for over 50 years the suffocater [[Verb] To stifle; to destroy; to extinguish; as, to suffocate] of the Cuban people, deserves to be in the mierda tanks of history. Full roll of toilet paper with Fidel Castro's face on every sheet. Ideal for parties, reunions or for plain personal pleasure. Order more than one. 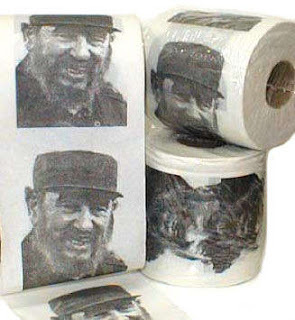 The ideal gift for your Cuban friend. Send me some... por favor! So here is the next iteration of my marriage of drawing with embedded electronics. In this case my ubiquitous Frida with an embedded video player which gives the owner of this piece to choose between a Power Point presentation or a video of Kahlo. 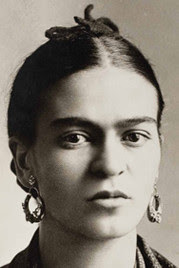 Above is the drawing with the heart cut out of her bosom - note that Kahlo's heart is fanged - this was a woman who took a bite out of life. And here is the electronic component which will be installed behind the drawing. In this frame it shows one of the multiple images which play by default when the machine is turned on. Here's the drawing with the electronics playing the slide show through the heart window. And in this close-up, the video of Kahlo is playing. Pencil this in for March! Born in Dublin, Ireland (which according to Irish creation myths was settled by Spaniards sent by King Milesius and thus why I'm always wondering why Irish people aren't considered Hispanic/Latino... Ireland that is... not Dublin (named after a witch who drowned in a pool of water), which was founded by Vikings and is thus not very Irish after all...), DMV area artist Jackie Hoysted made her home in Maryland in 1996 after working in France, England, Ireland and Florida as a software engineer. She has a degree is Computer Science from Trinity College, Dublin (which happens to own a lot of my artwork in their private collection) and a fine arts degree from the Corcoran College of Art & Design (which happens to own zip of Campello art... is that weird or what?). She has had multiple solo shows of her artwork throughout the US and has been featured in publications, including, The Gazette, the Washington City Paper and the Examiner and even here!. She was selected by Scott Ligon for inclusion his book The Digital Art Revolution and this wizard and talented artist is the creator of the project Send Me Your Last Cigarette. 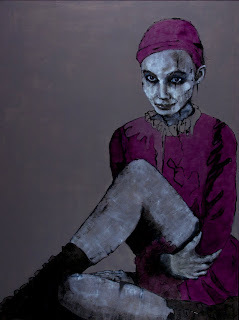 When you walk into Gallery 555dc you will be surrounded by Jackie’s current series “Out of Context” Girls! Nice Doesn’t Cut It. These women are "not to be messed with, taken for granted or pigeon holed. They can stand alone or together as sisters." 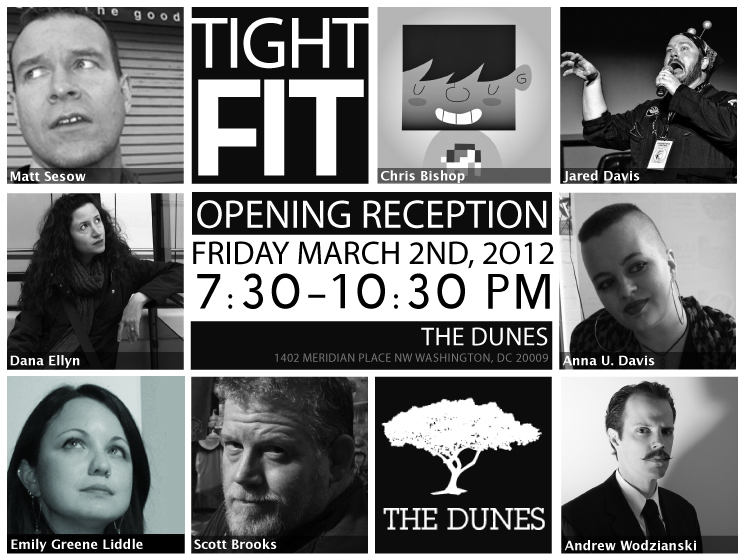 Champagne Reception: Saturday, March 3rd, 1-5pm and the show hangs till March 30th! 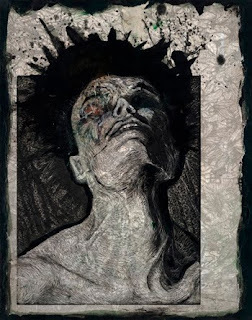 The Gazette's Topher Forhecz pops in with a nice review (also nicely illustrated) of Michele Banks and Kendall Nordin's exhibition at The Morris and Gwendolyn Cafritz Foundation Arts Center on Montgomery College’s Takoma Park/Silver Spring Campus. Read the review online here and then go to the opening reception from 6 to 8 p.m. on Feb. 9. For the last two days I've been cooking "Ropa Vieja" in the slow cooker. This is my favorite Cuban dish and it takes forever to cook properly, but when done right... OMG! You start with simply a few chunks of skirt steak, tomato sauce, onions, fresh garlic, and a few key spices and two days or so in the slow cooker. Now let's hope that the Giants kick some rump. I have always thought that the BlackRock Center for the Arts in Germantown, MD has one of the most beautiful and dramatic gallery spaces in the region. With its impossibly tall gallery space, it opens itself to all kinds of great curatorial ideas. 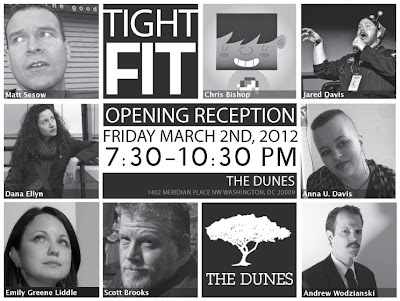 And tonight, GMU Professor Chawky Frenn will be opening his "Be The Change You Seek" solo show. And if you know Frenn's past, then you can expect a show sure to raise some eyebrows. Frenn uses his vast technical skills as a painter like a weapon, aiming his talented brush at social, political and historical issues. The opening is from 5:30 - 7:30PM. The show goes through Feb. 27. The Mexican Minister of Health, Salomón Chertorivski, has announced that the Mexican government has invented a vaccine to prevent heroin addiction. Details here, in case you think that I'm messing with you. The Torpedo Factory Art Center invites emerging and experienced artists to apply for one, two, or three-month residencies between June 1 and August 31, 2012. The Torpedo Factory Art Center in Alexandria, Virginia is home to more than 140 visual artists working in 82 studios. Artists create in a wide variety of media including painting, fiber, jewelry, ceramics, printmaking, and sculpture. The Torpedo Factory is open to the public every day; visitors are invited and welcomed into studios to watch artists at work. Visiting Artists will be provided with studio space and will be able to display and sell original work. The projects undertaken for this self-directed, creative residency must be compatible with available working studio spaces and facilities. Finalists will be selected by Paula Amt, owner of gallery plan b. There is no application fee. You can download the Prospectus from this website. So far, for my naked Superheroes series of drawings I've depicted the Man of Steel about a dozen times, Batman (and Batman and Robin) 2-3 times, and Supergirl about 6-7 times. Next is Spiderman, although I am having a hard time visualizing the drawing. It is easy to conceptualize Superman or Supergirl flying in the buff, but why would Peter Parker be climbing the facade of a building in the buff, and somehow still be wearing a mask or somethings that identifies him as Spidey? Maryland Art Place (MAP) has announced the hiring of Amy Cavanaugh Royce as its new Executive Director. I also know that she is one helluva good cellist! In her former position as Chief Operating Officer and Vice President of the ARCH Development Corporation in Washington, D.C., Ms. Royce spearheaded the development of four cultural facilities, which now operate as the cultural arm of ARCH organization. 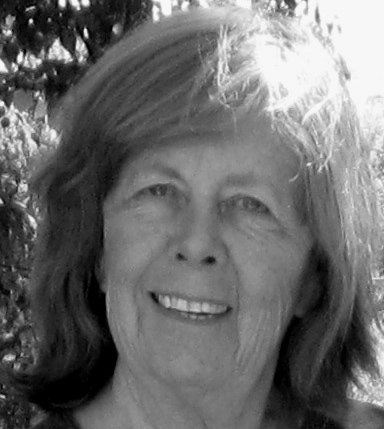 She also co-founded and operated a state-of-the-art contemporary exhibition space, Honfleur Gallery. Adah Rose Gallery (3766 Howard Ave Kensington Md, 20895, www.adahrosegallery.com is a relative newcomer to the DMV art scene, but under the experienced guidance of Adah Rose, it seems to have hit the deck running. “The Pleasures Here Are Well Known” - work by John James Anderson and Susan Stacks - is their next show, with an opening reception, on Saturday February 11, 6:30-8:30 p.m. (also music by Walker Road). The printed word and the acquisition of language are the principal ideas in the work of John James Anderson. His first series, “Building Blocks,” adopts the playful vocabulary of pop art with familiar logos and graphics which require reading through a lens that is both nostalgic and cerebral. 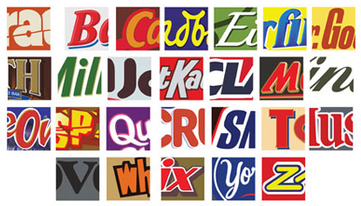 Mr. Anderson creates a graphic alphabet from the eye-catching lettering of soda cans, candy wrappers and cereal boxes. In his second series, “Out of Print,” language and the evolution of our collective literacy is also explored, this time in the decline of print journalism. Mr. Anderson collected the front pages of national newspapers and carefully erased portions of their content, resulting in graphic and poetic musings on the fate of mass communication. ... Beginning with the unconsciousness of a doodle, but executed with the commitment of surgery, Susan Stacks creates drawings with pencil and pen that are artifacts of a meditative experience. These intricate and elegant works reference landscapes, microscopic forms, and cartography. As Ms. Stacks draws, a twist becomes a tug, a dash a dot. Her influences are as varied as novels, mythological figures, plant and bacterial life, rock stars and vending machines. 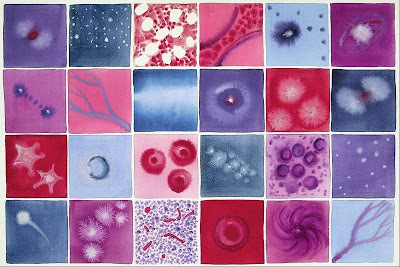 She refers to her drawings as emotional maps, parasites, friends, and penance.